Busy parents rejoice, because here at Federico Chrysler Dodge Jeep Ram, we have the ultimate family vehicle. With its modern tech, sleek design, and undeniable versatility, the 2018 Pacifica has a feature to please everyone. To experience it for yourself, head on over to 1875 East Edwardsville Road in Wood River, IL! Open the doors of the 2018 Pacifica and you'll immediately be impressed by the advanced technology that glows in the form of large touchscreen displays and creates convenience with strategic placement. In the center stack lies the available Uconnect® 4 system, which includes an 8.4-inch display for accessing music, checking the fastest route for the kids' soccer game, and much more. With Voice Command, standard Bluetooth® capability, and Sirius XM® Traffic and Travel Link1, it's almost like having a personal assistant. The ergonomic center console places pertinent controls within reach like the dual-zone automatic climate control. End the question of "are we there yet?" with the available Uconnect Theater2. It keeps rear passengers with not one, but two separate 10.1-inch touchscreens that can play movies, games, and more. 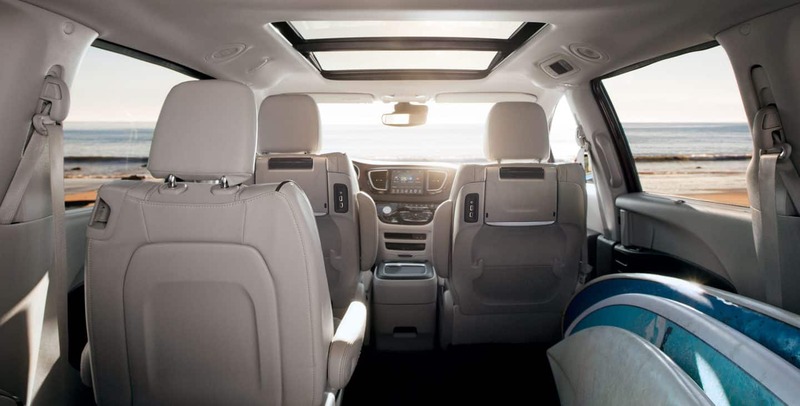 Whether you opt for 7- or 8-passenger seating capacity in the Pacifica, you'll have access to numerous different interior configurations. The Stow 'n Go® Seating System allows you to prioritize cargo space without leaving the seats behind. Simply fold them into their convenient storage compartment and make room for small bikes or other large items. Or, use the Easy Tilt function to add a bit of additional space and help third-row passengers enter and exit with ease. All of these adventures and shopping trips can mean a messy cabin, which is why you'll be grateful for the Stow 'n Vac™ powered by RIGID®. It makes clean-up simply and can be accessed anywhere, since it has its own storage section in the rear wall. Powering your trips on Vaughn Road and beyond is the Pacifica's 3.6L Pentastar® V6 engine, which achieves 287-hp and 262 lb.-ft. of torque. There's nothing boring about this minivan's performance, especially with the standard Engine Start Stop (ESS) technology and 9-speed automatic transmission. Need to bring boat out for the weekend? It's no issue with this powertrain's muscular 3,600-lb. Maximum towing capacity3. Not to mention the thrifty 28 MPG hwy4 that will make pit stops fewer and farther between. Grab your whole family and come to Federico Chrysler Dodge Jeep Ram to check out the 2018 Chrysler Pacifica for sale in Wood River, IL. Our friendly staff can't wait to tell you more about what each trim level of this model has to offer and how you can drive it home as soon as today with our financing options! 1 SiriusXM audio and data services each require a subscription sold separately, or as a package, by Sirius XM Radio Inc. Your SiriusXM service will automatically stop at the end of your trial unless you decide to subscribe. If you decide to continue service after your trial, the subscription plan you choose will automatically renew thereafter and you will be charged according to your chosen payment method at then-current rates. Fees and taxes apply. To cancel you must call SiriusXM at 1-866-635-2349. See SiriusXM Customer Agreement for complete terms at www.siriusxm.com. All fees and programming subject to change. Not all vehicles or devices are capable of receiving all services offered by SiriusXM. Current information and features may not be available in all locations, or on all receivers. 2 Certain features require a compatible streaming device and may use your device's existing data plan. See dealer for details.